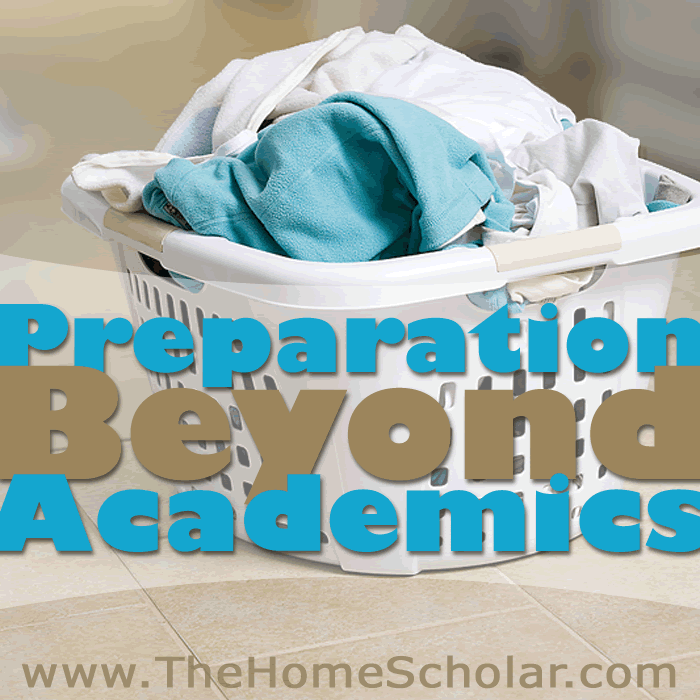 Preparing for college involves more than equipping our children with a strong academic background. 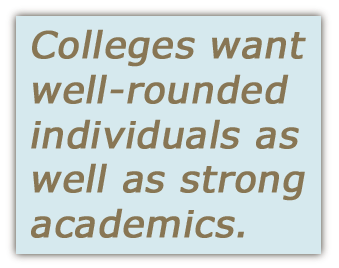 Colleges also want students who are well-rounded. Not just well-rounded in their rigorous curriculum, although that is important, but also well-rounded as individuals. Why do colleges care? These questions play a significant, if perhaps subconscious role in admissions decisions. Clearly, colleges want to admit students who appear to be well-rounded and show potential for success. Demonstrated experience in such areas as leadership, volunteer work, and employment all contribute to a student’s development as an individual, as well as the development of character, self-motivation, and socialization. These attributes will help the colleges see that your student is someone worthy of admission! Colleges want to see leadership demonstrated in a student’s life. Leadership experience may come through Boy Scouts, 4-H, youth groups, sports, or teaching others piano, guitar, or chess. Leadership comes from passion, experience, and a desire to share interests with others. In other words, to be a leader, one must first want to be a leader. 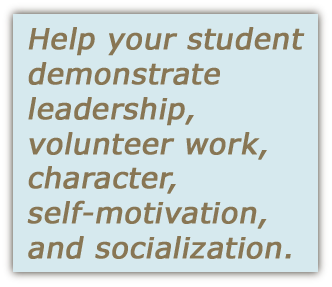 When dealing with college applications, it is pretty easy for extroverted teens to highlight leadership. Identifying leadership in the quiet teen is a bit more of a challenge. The quiet ones may not recognize their leadership at all. In such cases, you may need to gently point it out to them. But whether or not they see it in themselves, it is often recognized by outsiders. By the time our youngest applied for college, he had amassed quite an impressive resume of leadership positions. But our oldest demonstrated his areas of quiet leadership by teaching classes to others, and during the full-tuition scholarship competition, he also came away with the big prize. Colleges love to see students who give to the community, and students will also benefit from volunteer work. Encourage your children to volunteer for community service. This could be through a faith-based organization, in your local community, through a sports league, or just within your own neighborhood. The possibilities are endless. One way to find a good fit for your children is to encourage them to volunteer in their area of passion. Are they excited about gardening? Maybe they could volunteer with the local gardening club. Do they enjoy building model rockets? Perhaps they can volunteer with a local science camp and help others learn all about it. Whatever your child does that is helping others can count towards volunteering. Students also become well-rounded through employment experiences, including internships and apprenticeships. Colleges will be impressed by students who demonstrate the skills needed to be employable, and your students will also benefit from work experience. Internships are a very popular option for homeschoolers to “test drive” a vocation or profession. Whether these are paid or unpaid internships, they can be valuable, if only for the insights they provide. Students who successfully complete an internship may even eventually land a full time position at the same company. But even if they don’t, internships can yield some valuable letters of recommendation used for college admissions. Finally, apprenticeships are a wonderful way for students to get some work experience. These opportunities often grow out of the passionate interests that develop as students reach the teen years, and begin to discover more about themselves. All of these employment experiences will show the colleges that your student has what it takes to succeed in the real world. Homeschoolers have the advantage in socialization, since they spend their childhood socializing across a broad spectrum of ages, classes and cultures. They are not limited to narrow socialization, segregated by age and status common in a typical American high school. Consequently, when they are called on to interact with adults in the college admission process, they often feel right at home. Socialization was, in fact, the deciding character feature when my boys brought home two full-tuition scholarships. Every applicant invited to the full-day scholarship competition had great grades and test scores. The college admissions staff told us that they were looking at social skills as the deciding criteria. How well did these young scholars interact with one another, with the faculty, and with the staff on campus when they thought no one was looking? This seems so ironic when a common question about homeschooling is, “What about socialization?” My homeschoolers took two of the ten scholarships awarded, based on socialization! Socialization is important to colleges, so make sure you demonstrate your student’s accomplishments in this area! Closely related to socialization is character. Colleges want to admit students with strong character who will go on to reflect well on their alma mater. How well have your family values been absorbed by your kids? Growth in character development is directly correlated to time spent with your kids. The “quality time” is not nearly as important as “face time.” Face time can be accrued by the bushel load when you are teaching your kids for hours a day at home, shaping and molding their character day by day. The reason you don’t hear about the negative effects of peer pressure in homeschool families is that the “peers” are typically siblings who are all being nurtured by the same loving set of parents. In college admissions, character may come through best in the application essays. Encourage your teens to write about experiences that highlight their character. Brainstorm with them on the ways that they have given themselves away to others during their childhood and adolescence. Did they come with you when you volunteered at church or in the community? If so, what did they learn? Did they ever visit shut-ins with you? How did that affect them? Character is one of those traits that is caught rather than taught, so make sure your students can convey these experiences in their application essays. Self-motivation is one of my favorite attributes, because of the delightful serendipity involved. Busy with my household chores, I was unwilling to re-educate myself on higher-level high school math and science. After a while, it became clear that my children had to become self-motivated and learn higher-level math and science on their own, since my husband and I felt incapable of teaching it. And they did learn it. With the right curriculum and video tutorials, my boys basically taught themselves calculus and physics. The results were twofold. First, they learned how to be self-taught. Second, they experienced the satisfaction associated with doing it independently. When you encourage self-reliance and self-teaching, you are doing your teen a favor that will pay dividends when they go to college. Ironically, a favorite expression university professors use with their freshman students is, “I am not your parent.” This is supposed to underscore the point that no one will be nagging the students to complete their work. If your student already knows how to learn on their own, they will start college with a tremendous advantage over their spoon-fed peers. Can you really have it all? No! Although it is important to be well-rounded, please remember that nobody has it all. When you fill out college applications, it becomes clear that your student may excel in one thing and not another. Don’t despair. 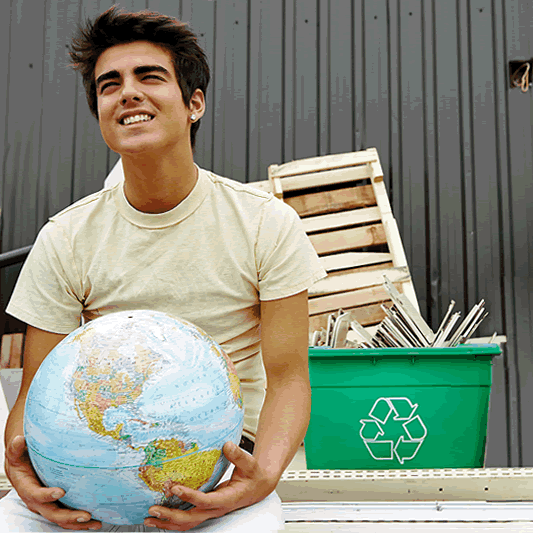 My students had great SAT scores, but they only had tiny amounts of volunteer work. They were employed and involved in sports, so there was hardly any time for community service. My son would occasionally play his piano at nursing homes or at church, but volunteer work was really not our area of strength. Nobody has it all. If your students are strong in some areas, but not so strong in others, that’s okay. It just means they are human! When you complete a college application, one of the things they ask for is a list of “activities and awards.” In addition to being a way for you to help your kids stand out from the crowd, there is another, little appreciated aspect of this exercise: what you record is entirely up to you! The activity and awards list is only for successes, and failures don’t go on the list! • Worked at a fabulous job? On the list! ~ 28 job interviews followed by rejection? NOT on the list! ~ Never actually won a match? NOT on the list! As homeschool parents, the failures of our children and ourselves are always right in front of our eyes. Our failures may look huge and discouraging. Failure is negative feedback, telling us what we do NOT do well, and an encouragement to keep trying. But in the face of failure, remember that we also have some success. Only things our children do well are put on the activity and awards lists. Don’t list the bad things, just the good things! Remember to write down those wonderful activities and awards when they happen so you won’t forget anything. You don’t want to be facing the application form and suddenly draw a blank. • Colleges want more than academics. • Leadership, community service, and employment are important. • Social skills, character, and self-motivation are valuable. 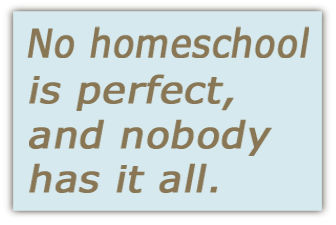 • Nobody has everything, no homeschooler is perfect. • Failures do not go on the activity list. If you would like a more in-depth treatment of college preparation beyond academics, I recommend my Kindle book, Beyond Academics: Preparation for College and for Life. Copyright © 2013 The HomeScholar LLC (www.HomeHighSchoolHelp.com). Text may be reprinted without permission if used in full, including the bio (below) and this copyright, except for use in a book or other publication for rent or sale. 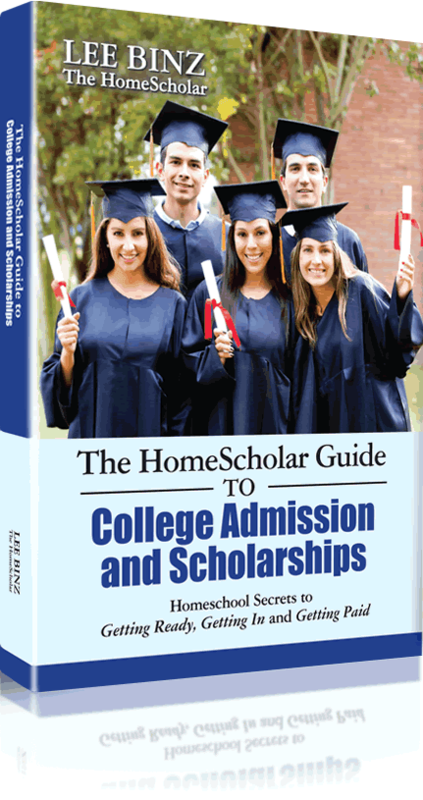 Get more homeschool high school help on The HomeScholar Facebook Fan Page. ØWorked at a fabulous job? On the list! ·28 job interviews followed by rejection? NOT on the list! ØAwarded $200 in scholarship money by the community? On the list! ·Applied to 10 big-money scholarships, but rejected by each one? NOT on the list! ØMember of the wrestling team? On the list! ·Never actually won a match? NOT on the list!